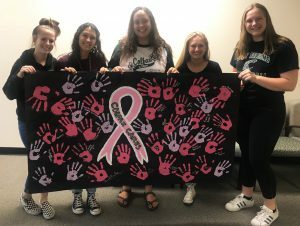 The students created a 4-foot banner with pink handprints showing students’ “slapping out cancer” that is now displayed outside the Sutter Auburn Faith Hospital Infusion Center. 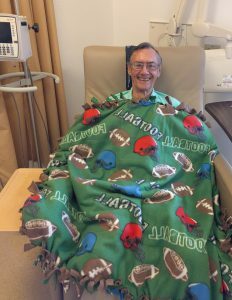 In addition to the sign, the students also donated nearly 50 handmade blankets to be distributed to patients this month. Eugene Smith wrapped up in a football-themed blanket. 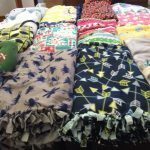 The students from the Colfax Leadership and Leos clubs spent weeks making the blankets, two pieces of fleece material that are knotted together to form an extra layer of comfort and warmth. Ellen Carlson, oncology nurse navigator at SAFH, was happy that high school students recognize the impact cancer can have on both a family and a community. With more than 3 million breast cancer survivors in the U.S., we have come a long way in the fight against breast cancer, said Ellen.